From your first ice climbing trip, to ticking a monstrous testpiece, we are here to guide you along on your adventure. Guided climbing focuses more on the experience of getting out in the mountains and climbing routes, and less on gaining instruction in how to do the sport on your own. Guided climbing is done in a climbing team of 2 or 3 people (including the guide). It is for absolute beginners all the way to expert climbers. Due to the seriousness of the sport, the amount of time needed to become independently proficient, and the difficulty of finding solid, available partners, many folks recognize the benefits of allowing a trained professional to lead the way on their climbing adventures. At Rockies Ice & Alpine Specialists, many of our clients return to Canada year after year, and forge good friendships over hard-won climbs. As guides we learn your abilities and tailor each days climb to what we believe you will enjoy. We coach you and teach you the skills to become a contributing member of our climbing team. We believe in climbing in a controlled and confident manner. We will not drag you up a route, but will help you acquire the skills needed to climb in an efficient and confident manner, even on the most difficult terrain. On our trips, a logical progression of routes is always followed. Guides use their intuition and experience to put together a trip at the right pace. Respect for the mountains, and good style, are required on all climbs. We will always have a new climb in mind for you every day, as well as backup options, and gather your input to make the selection. You can leave as much of the trip as you would like in our hands, choosing the best route for you under current weather/route conditions is a big part of what we do. Or perhaps you have a challenging climb you dream of, such as Polar Circus, but do not yet have the skills and confidence required for an ascent. We know what such climbs require and can select a number of routes that will build your skills and strength to a point where you can attain your dream climb. When you are properly prepared, and conditions allow, we will head out on for the climb of your lifetime. Expert ice climbers hire us for their climbing trips, as professional climbing partners. Many people nowadays find their vacation schedules tight, and dependable, solid partners tricky to find for a climb in Canada. Guides will commit reliably to YOUR time schedule. We have local access dialed and can take care of all the logistics. We are professionals, experts at all aspects of this sport. We provide the security of emergency training, contacts and equipment. We are fast, efficient climbers, able to lead hard pitches quickly with minimal protection. And we never whine! We are happy to teach the ‘tricks of the trades’ and share our skills. Guides ensure that you get to the goods and we facilitate a successful and enjoyable days climbing. 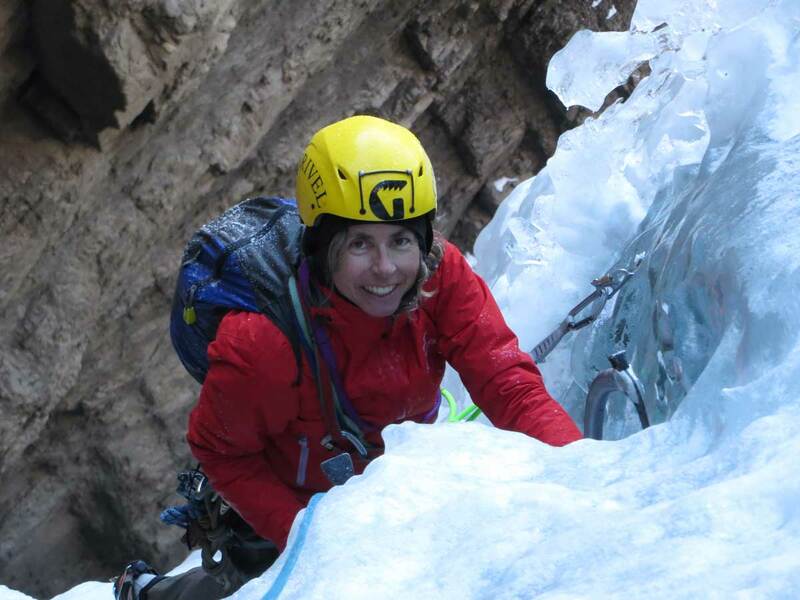 We are the preferred guides for advanced ice climbers who are dreaming of the Rockies hardest routes. We look forward to showing you the finest climbs of Canada and the good times we have out here. For all trips we require details of your climbing experience, and an overview of your personal climbing goals. This allows us to custom plan the type of routes we can climb with you. Send us an email or call us to plan your climbing vacation.